heads have bodies. Did you? The giant stone statues scattered around remote Easter Island are even more impressive than they first appear. Hidden from view, the heads are attached to bodies that extend meters underground. 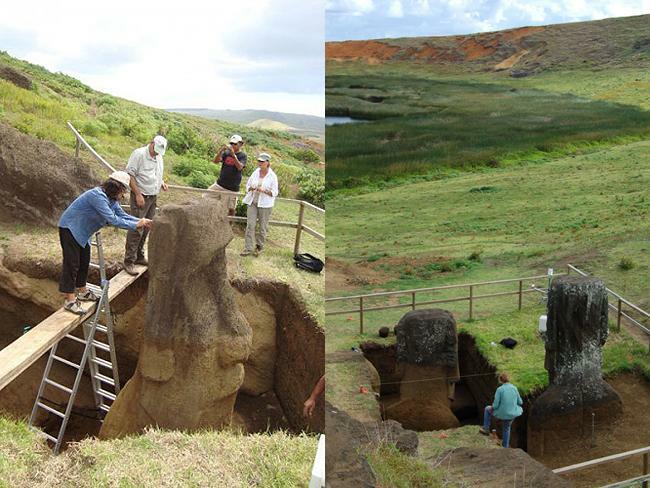 Excavation: 150 statues stand upright on the slopes of Easter Island's quarry. They are buried to varying depths and often appear as heads only. 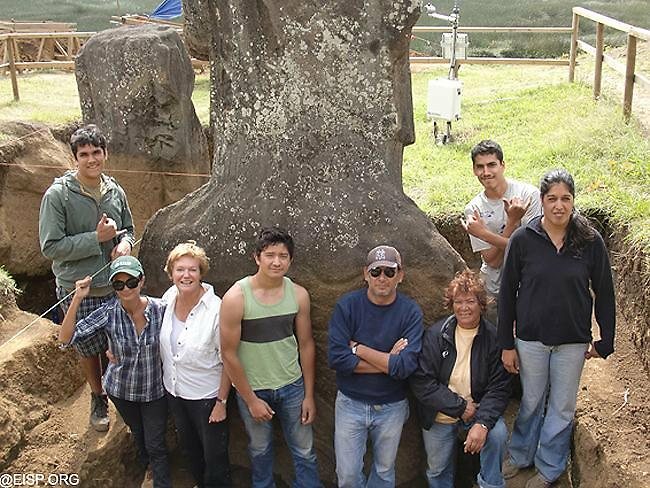 A dig at Rano Raraku, the quarry where Easter Island's statues were carved out of rock, is casting new light on a remarkable discovery forgotten for decades. 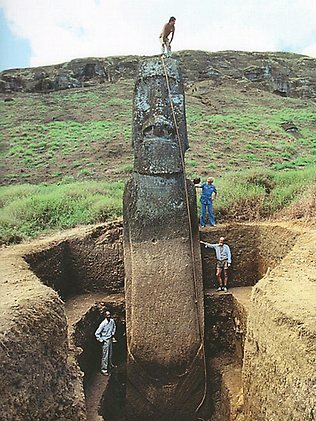 In 1919 pictures of the first excavations by the Mana Expedition to Easter Island revealed that some statues were full sized. The discovery was confirmed in 1955 by the explorer Thor Heyerdahl when his Norwegian Archaeological Expedition excavated a statue. Island, began in the 1990s. 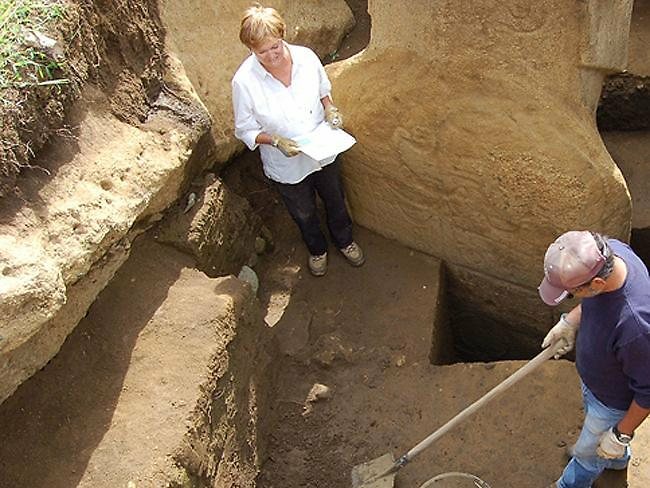 Today, a team of local archaeologists is working to unlock the secrets of their mysterious island. 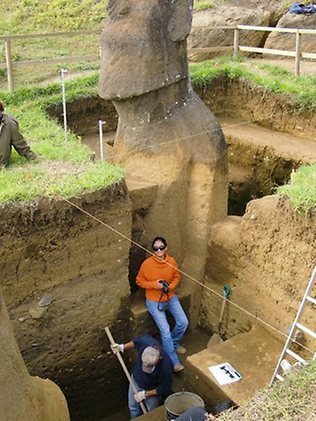 have excavated two seven metre tall, full-size statures, estimated to weigh about 20 tons. For anyone who has stood next to these huge, imposing heads, or marveled at how a primitive people moved them many kilometres from one side of the island to the other, it's a remarkable discovery. 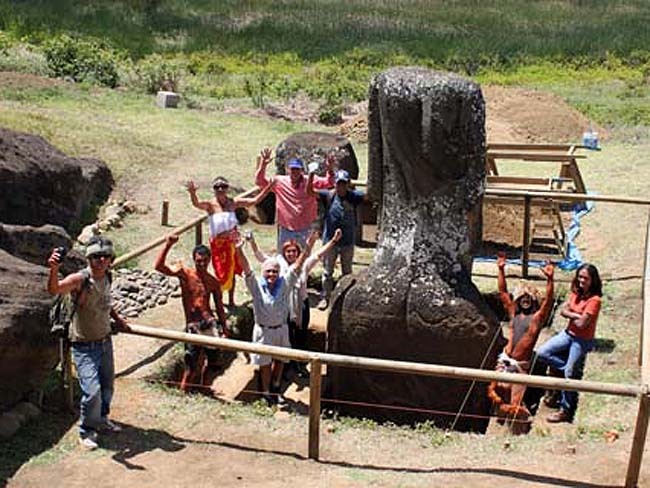 Since 1990, the Easter Island Statue Project (EISP) has been undertaking an archaeological survey on Easter Island, aiming to create a full and complete, island-wide inventory for each statue. "It is vital to have a good record of the statues," said the EISP's director Jo Anne Van Tilburg. "What they look like, where they are found, and how they relate to the sites on which they are found. It is also essential to amass a catalog of the statues as artifacts in order to preserve them for future generations." Since it was named by the Dutch explorer Jacob Roggeveen on Easter Sunday 1722, the 887 monumental statues of Easter Island have inspired wonder and raised countless questions. James Cook visited in 1774? and fall of Easter Island as a warning of the environmental and societal dangers of over-exploitation. Some questions were tackled by the first archaeological expedition to Easter Island, led by Katherine Routledge in 1919. "Unfortunately, the excavations she conducted were very poorly documented, if they were documented at all," said Van Tilburg. "Therefore, her work was highly flawed and needs to be clarified." One of the most isolated islands on Earth, Easter Island sits 3,550km west of the South American mainland. It was first settled by Polynesian people who arrived by canoe as part of a great wave of Pacific colonisation. For decades archaeologists have speculated about how the sculptures were moved and made. How did the islanders move the sculptures? "The most certainly did not 'walk' them over challenging terrain for many miles, as has been claimed by some," said Van Tilburg. "More probably statues of different sizes and shapes were moved in a variety of common-sense and practical ways, including especially in horizontal positions." Eventually, the population of Easter Island swelled to around 7000 people, all competing to build statues. "I don't think there is any question among today's researchers that humans were responsible for deforestation on the island, and that deforestation caused significant challenges to the social fabric," said Van Tilburg. "Nor is there any question that deforestation forced social adaptation, some of which took place in agriculture. "collapse." They find it perforative or somehow blame-filled." And what lessons can modern humanity learn from Easter Island? "Society can learn to take the long view and pay attention to the big picture," says Van Tilburg. "Rapa Nui society, as the data make clear, was highly conservative but also adaptive when faced with challenges." 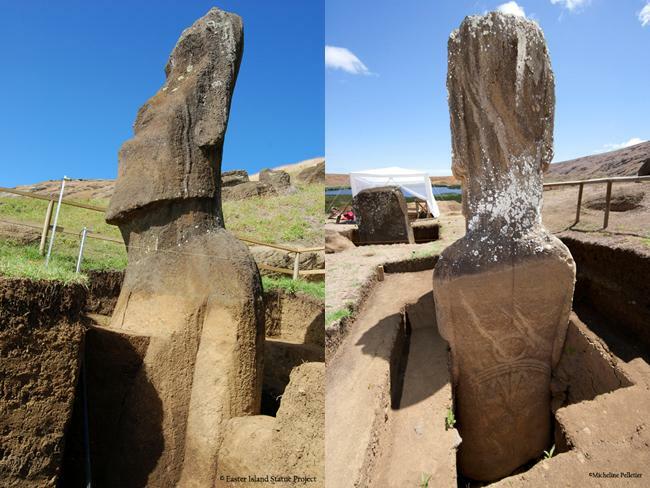 Archaeologists have known since 1919 that Easter Island's heads have bodies. Did you? 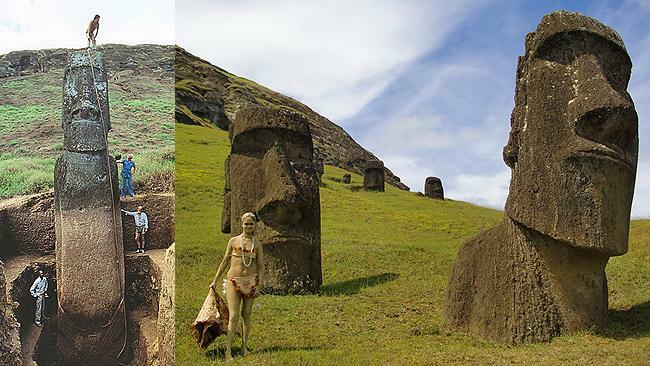 THE giant stone statues scattered around remote Easter Island are even more impressive than they first appear. Hidden from view, the heads are attached to bodies that extend metres underground.